A funeral was held Sunday for emergency doctor Yoon Han-deok, who died of a heart attack at his office and whose death cast light on the difficult working conditions faced by emergency medical staff. Yoon, head of the National Emergency Medical Center, was found dead on Monday during the Lunar New Year holiday. Yoon, who often had to work through the night, is believed to have died due to overwork. The official cause of death was sudden cardiac arrest. Some 300 family members, colleagues, friends and ordinary South Koreans gathered at the National Medical Center on Sunday morning to attend his funeral, pledging to carry on his work to enhance the country’s emergency medical services. Yoon’s friend Dr. Lee Guk-jong, the renowned head surgeon at Ajou University Hospital’s trauma center, compared Yoon to Atlas, the figure from Greek mythology who bore the weight of the world on his shoulders. “However devastating the emergency medical conditions are, he burned himself out in pursuit of his justice -- that the emergency medical system cannot be neglected,” said Lee, who made the news in 2017 when he saved the life of a North Korean shot while defecting across the demilitarized zone. The sudden death of Yoon, 51, shed light on the poor working conditions faced by staff delivering emergency medical services that are essential to public health. In a field where life-and-death matters are decided practically every second, staff at emergency medical centers often struggle with a lack of personnel and long working hours, which force them to sacrifice their own health to deliver high-quality emergency medical services. Doctors tend to avoid working for emergency care centers due to the heavy workload, combined with lower pay and fewer perks, observers say. When Yoon’s wife could not reach him the weekend before he died, she said she thought he must have been busy as usual. During national holidays, demand for emergency medical services soars because most hospitals and pharmacies are closed. Last year on average, about 28,000 people visited emergency centers nationwide every day during the Lunar New Year holiday -- twice the average number of patients on an ordinary day. To remember Yoon, Lee vowed to have Yoon’s name engraved on the next air ambulance that the trauma center acquires. Yoon joined the emergency center in 2002 and assumed the lead role in 2012. The center oversees 17 emergency medical service centers nationwide. Yoon has been hailed for his efforts to establish and improve the country’s emergency medical system. He tirelessly convinced lawmakers to secure funds in the budget to introduce air ambulances in 2011 and to establish trauma centers across the country. Thanks in large part to his efforts, the rate of preventable trauma deaths -- that is, lives that could have been saved with timely treatment despite severe injuries -- dropped from 35.2 percent in 2010 to 30.5 percent in 2015, according to government data. The government aims to reduce this figure to 23 percent by 2022. 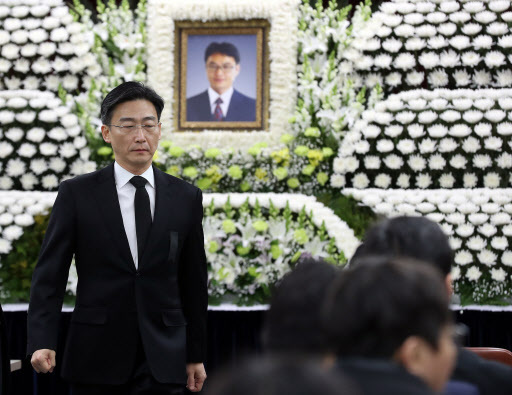 “I hope my father’s lifetime dream to make Korea a country where emergency patients receive treatment properly at the right time comes true,” Yoon’s son Hyung-chan said at the funeral. Ordinary Koreans, politicians and government officials also paid respects to him over the past few days. President Moon Jae-in said in a Facebook post that he was “sorry and grateful” to Yoon because the doctor had put others’ lives first, before himself and his family. The government is considering recognizing him as a person of national merit.